A Sunday at the beach was anything but typical on Sept 19, 2010, when members of the Sicily Wildlfe Fund released nine loggerhead sea turtles on the San Lorenzo beach near Noto in eastern Sicily. Ranging in size from 20 to 50 kilos, the sea turtles looked a bit confused when first placed on the sand near the water’s edge, and tentatively flopped forward towards the sea. Once in the water, they happily swam away to the cheers and applause of the Italian families gathered to watch this unusual event. More sea turtle news: The San Lorenzo beach near Noto in eastern Sicily may offer lovely walking as well as delightfully clear water for a dip, but this summer it also appealed to a couple of loggerhead turtles, who made it their nesting ground. The two nests containing approximately 70 eggs each, were made by caretta caretta sea turtles on 2 separate occasions this summer, July 31 and August 15, 2010, and are to due to hatch in October 2010. I’ll keep you posted! I was truly amazed that Sicily had Sea turtles, and now even more wonderful that they’ve laid eggs onto the beaches they were released from. 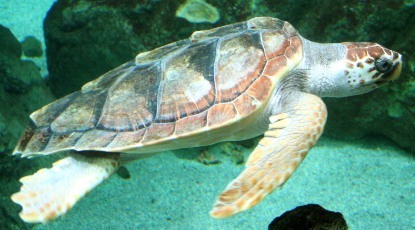 I was born in Sicily had never heard my parents talk about sea turtles, my dad was a well read informed person. I knew and know the Island is magical , but its even more so now. Thank you for sharing, much success on your endeavers. Apparently this is the first time in nearly 15 years that sea turtle eggs have been laid in Sicily- fingers crossed that they hatch and most make it into the sea! it’s not the first, and it’s amazing to see turtles in southern sicily, but it’s the first summer we have seen not 1 but more places where they let eggs!! it’s a thermometer about the level of ecology of the sea. don’t remember the caretta-caretta need 20 years to grow up to make eggs!! So happy to have discovered your wonderful blog, Anita. I happened to stumble upon it while research turtles in Sicily. I am getting ready to speak American students here in Sicily about sea turtles and was curious to see what varieties were local. I know that this blog post is from over a year ago, just curious, do you have any updates on the turtles in the Avola/Noto area? Is there any way to get in touch with local wildlife officials to get more current information? Thanks for any info you might have to share. I am also eager to read other blog posts of yours related to Sicily.